On hot days, a cold treat is just what the doctor ordered—especially when it is this healthy and easy to make! Some popsicles are made with only sugar, which can make your blood sugar spike, leaving you cranky and hungry later on. Get your fix with a fruit-filled popsicle instead. 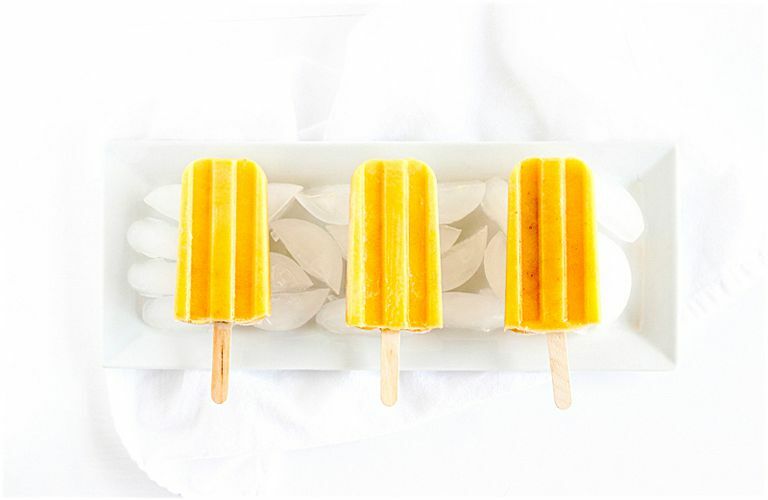 These healthy tropical mango popsicles are made with real banana and mango with creamy coconut milk. They’ve got fiber, potassium, and no added sugar. All you have to do is blend everything together and freeze. You’ll have delicious, better-for-you popsicles in just a few hours and can beat the summer heat and feel great at the same time. All ingredient in a blender or food processor until smooth. Pour into popsicle molds, insert sticks, and freeze at least 6 hours or until solid. Use any kind of milk in place of coconut milk if you wish. If using frozen mango, thaw before blending. Thaw for a few minutes or run mold under warm water before removing pops from molds. Once frozen, popsicles can be removed from molds and placed in a plastic bag between sheets of waxed paper or parchment in the freezer.